LOUISVILLE — For Emily Donovan, youth director at Little Chapel on the Boardwalk in Wrightsville Beach, North Carolina and co-founder of Clean Cape Fear, the fight to protect and nurture children goes far beyond the walls of the church. She is presenting testimony today to the Congressional House Energy and Commerce Subcommittee on the Environment on the dangers of per- and polyfluoroalkyl substances (PFAS) as a result of local pollution. Her written testimony, titled, “Perfluorinated Chemicals in the Environment: An Update on the Response to Contamination and Challenges Presented,” raises awareness of the persistence and toxicity of these chemicals that do not degrade. Saying PFAS “live forever in our environment, resurfacing and recycling themselves through our bodies, our food chain, and our ecosystems,” Donovan points to water table contamination attributed to Chemours/DuPont plants pollution of nearby water sources. 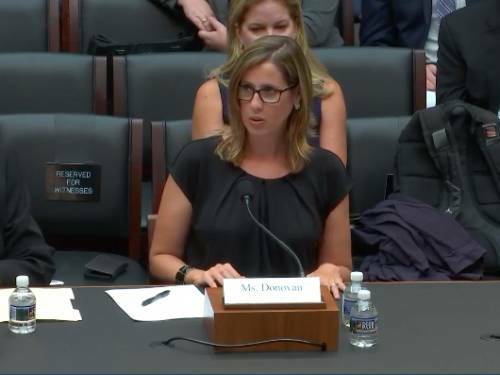 But Donovan’s concern and testimony aren’t merely conceptual — she’s focusing her remarks on how PFAS-related exposure has affected four families suffering from rare and bizarre cancers or benign tumors in her community, including her husband who had a brain tumor six years ago. Two other families attend Little Chapel on the Boardwalk and have children in Donovan’s youth program. The final family is that of Donovan’s best friend where the mother, grandmother and grandfather all have rare cancers. “I did not have to search far to find significant health problems in our area,” she said. The subcommittee’s hearing can be viewed here. Donovan’s complete testimony can be downloaded here.